On-staff agronomists who demonstrate strategies and provide free agronomic advice to enable farmers to incorporate more efficient fertilizer practices. Access to reduced-price tools and programs that assist farmers in improving fertilizer usage, crop production, water quality, and soil health. Economic incentives to diversify crop production and create a market for winter wheat cover crops. In conjunction with this announcement, EDF released a case study authored by Datu Research that describes Smithfield’s supply chain sustainability programs and the value they generate for the environment, farmers, and Smithfield itself. Within the case study, Datu provides detailed information about Smithfield’s efforts to improve grain farmers’ fertilizer management practices and soil health, as well as the company’s other sustainability initiatives, that were developed in partnership with EDF. In addition to its efforts to help grain farmers grow a more productive and sustainable crop, Smithfield partnered with Anuvia® Plant Nutrients in early 2018 to create sustainable fertilizer from renewable biological materials collected from manure treatment systems at the company’s hog farms. Anuvia’s fertilizer provides the benefit of a more controlled release of nitrogen while reducing GHG emissions and producing a smaller environmental footprint. Later in 2018, Smithfield announced the expansion of its “manure-to-energy” projects to further reduce its GHG emissions. These efforts transform hog manure into renewable natural gas through a refinement process that captures and upgrades biogas to natural gas that is then injected into nearby pipelines. Smithfield announced the implementation of “manure-to-energy” projects across all its hog finishing spaces in Missouri and 90 percent of its hog finishing spaces in North Carolina, Utah, and Virginia via the nationwide expansion of Smithfield Renewables, the company’s platform dedicated to unifying and accelerating its carbon reduction and renewable energy efforts. In Missouri, Smithfield is also reestablishing native grasslands, prairie, and milkweed to create habitat for monarch butterflies and provide biomass for methane generation in renewable natural gas projects. 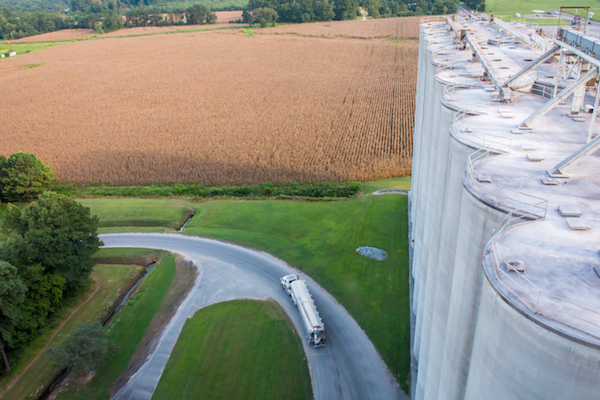 For more information about Smithfield’s industry-leading sustainability program, please visit smithfieldfoods.com/environment.